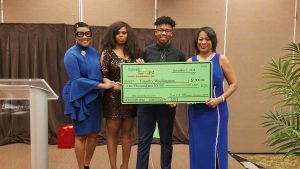 Three DeKalb County School District (DCSD) students have earned $1,000 each in scholarships thanks to one metro Atlanta nonprofit. Stephenson High senior Whitney McNair, Arabia Mountain High senior Timothy Washington, and Southwest DeKalb High senior Ablavi Woeledji, each earned $1,000 as part of Live Healthy & Thrive Youth Foundation’s annual Pinnacle Youth Scholarship program. The three DCSD students—who made up the majority of the five total recipients—were honored at Live Healthy & Thrive’s annual Pinnacle Awards & Scholarship Gala at Georgia Piedmont Technical College on December 1. Southwest DeKalb’s Woeledji currently resides in Decatur, has a 4.1 grade point average (GPA) and plans to attend Boston University upon graduation. She plans to major in biology as a pre-med student. Stephenson’s McNair lives in Stone Mountain, boasts a 3.6 GPA and plans to major in biology at Albany State University. Arabia Mountain’s Washington of Lithonia currently holds a 3.1 GPA. After graduation, he plans to attend Tuskegee University where he will major in veterinary medicine. Dr. Green was also named the recipient of the 2018 Pinnacle Award for Education, and present at the ceremony to be honored for his commitment to education, achievement, and bettering the lives of metro Atlanta youth. Other individuals honored included Breanna Lathrop of Good Samaritan Health Center; Chef Keith Hand of Bridge Catering; Shanti Das of Silence the Shame & THHP, Inc.; and Victor Mbaba of the African Children’s Fund. Live Healthy & Thrive Youth Foundation is a charitable, tax-exempt, 501c3 nonprofit organization. The organization’s work serves as the conduit to develop a closer affiliation between children of today and the community-at-large through outreach and educational programs. For more information, visit the LHTYF website.